Our friendly, lively and caring group, currently has 34 members. We are always pleased to welcome new members and ensure they are greeted in a kindly and helpful way. As ours is an evening group we have a mixture of members, some who are working full/part time and some who have retired. With this mix we endeavour to provide a variety of activities that can include as many of our members as possible. With this in mind we have had day trips during the week and at weekends, evening and daytime outings and extra regular groups at different times and days. Our groups include a walking group, craft group and a supper group, which visits different restaurants around the town. At our regular evening meetings, members have enjoyed a variety of topics including, learning to salsa, Italian cooking and hearing about the work of local charities. There has been a variety of speakers to our meetings including entertainers and local business entrepreneurs. We love a party and always celebrate our birthday in April, we are 36 this year. Our group has a strong presence in the community and regularly supports local events e.g. the Summer Fayre. We have our own fund raising coffee mornings and help at other activities. 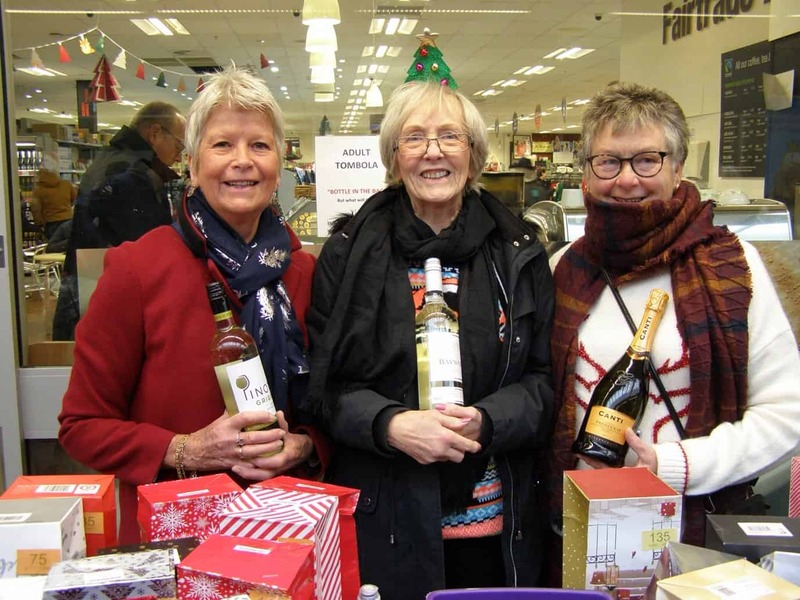 The photo shows three of our group running the very popular bottle stall at the Christmas Fayre.